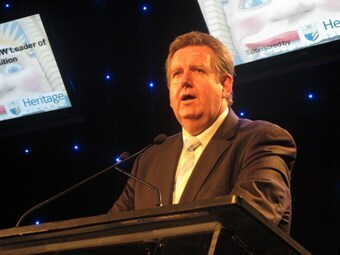 NSW Opposition Leader Barry O’Farrell made a commitment to BIC conference delegates in Sydney this week that a Liberal government will commit to a new department free of political interference to address Sydney’s infrastructure backlog. "This Government’s on again off again plans for transport has been based on a calculation of where the votes lie," O’Farrell says. "When a politician draws a line on a map there are two certainties – firstly that the project is more likely to be about politics than public or community interest, and secondly it’s either not going to be delivered or delivered over budget." O’Farrell cited the case of the Epping to Chatswood rail link which he says is a billion dollars over budget and three years delayed. "We need to put some rigour back in to the prioritisation of planning and infrastructure projects in this state," he says. "We are committed to creating a body called Infrastructure NSW, a body that will be shamelessly at arms length from politicians." O’Farrell says any list of infrastructure projects will be prioritised to meet NSW’s economic needs and delivered regardless of any change in government. He says Infrastructure NSW will put together a twenty year state infrastructure plan with five year strategies attached to the state’s budget. "That’s what happened in Queensland from Goss through Borbidge, Beattie and Bligh, and also in Victoria from Kennett to Bracks and Brumby – they’ve all had the sense to have proper planning." O’Farrell’s Government will issue ‘Waratah’ bonds as part of NSW’s infrastructure funding regime. "This will give mum and dad investors and superannuation funds the opportunity to invest in a government-backed rate of return and assist us overcome the state’s infrastructure backlog," he says. O’Farrell sees this as a way to start the funding process. "Sydney has received less in infrastructure funding under the Federal Government’s program than any other capital expect for Darwin," he says. And the reason, according to O’Farrell, is the Federal Government’s perceived lack of confidence in the planning and rigour to get project funds working in NSW. "Nowhere is infrastructure needed more than in transport," he says. An O’Farrell-led NSW Government would also accede to the bus industry’s call for a single interfacing public transport authority, as proposed by BusNSW and others. "Our proposed transport authority will make sure that different modes across Sydney and NSW are integrated," he says. Like Infrastructure NSW, O’Farrell says the new authority will take the politics out of managing transport in NSW. "Our proposal is to have a single agency which will cover all major transport, oversighted by an independent board that will have representatives of the bus sector sitting on it," he says. For the bus and coach sector, O’Farrell believes the Integrated Transport Authority will see more integrated transport planning and better integration of transport decision making. "So not only does the transport system work seamlessly across all transport modes, but the decision making processes for future transport investments takes account of which transport mode will best suit the community’s needs." He also believes such an Authority will not allow politicians to ‘pick winners’, but allow the industry to determine what’s needed to fill in gaps across the entire network. "We realise that the bus industry is an integral part of the overall public transport network in this city, when all too often this has been forgotten by the state government." O’Farrell says he will ensure there is a strong correlation and cooperation between the bus industry and the railway sector. "Integrating buses to the rail system makes an enormous amount of sense," he says. He says part of this is as simple as having railway planners talk to the bus industry before a timetable change is made, and not afterwards. O’Farrell says his ministry would include a Minster for Planning and Infrastructure. "Planning and Infrastructure is the flip side of the same coin, yet we have separate portfolios in this state and it shows," he says. High priority will also be given to sorting out Sydney’s congestion problems in the inner-west, and the saturation of rail lines in that part of the city. O’Farrell referred to a study conducted in 1998 which led to a clearways program for the area with a use by date of 2011 before a second harbour crossing would be needed to keep bus and rail moving. "For more than a decade a second harbour crossing has been part of the plans and Labor promised it at the last election and so far there is just a document," he says. "It’s the sort of project that would be on the list of issues for consideration by Infrastructure NSW." He says if Sydney’s rail network was to expand it would be good news for the bus sector. "It’s not a threat, it’s an opportunity, and the more these projects are put off the greater the cost."